Let us get the elephant out of the room first. The defense did play better in that nine game streak, but like the 4-0 end of the 2011 season they also faced bad or handcuffed offenses. The Giants (twice), Buccaneers, Raiders and Aaron Rodgers-less Packers stink; the Cardinals are mediocre and were missing their best running back, the Cowboys are above average and were missing their best running back too and the Lions game was played in conditions that warrant an asterik. 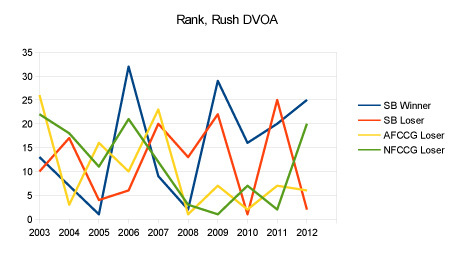 The Eagles run defense is very good, but the run game is not as important as it has been in the past. So while making a team one dimensional by shutting down one side of the offense is certainly a good thing, the Eagles are shutting down the lesser portion of the opposition. 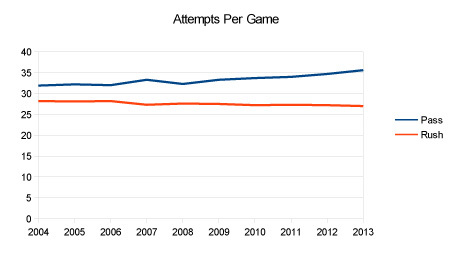 Against the pass, the Eagles are at best mediocre. Why is this, and why did the house of cards suddenly fall apart against the Vikings? 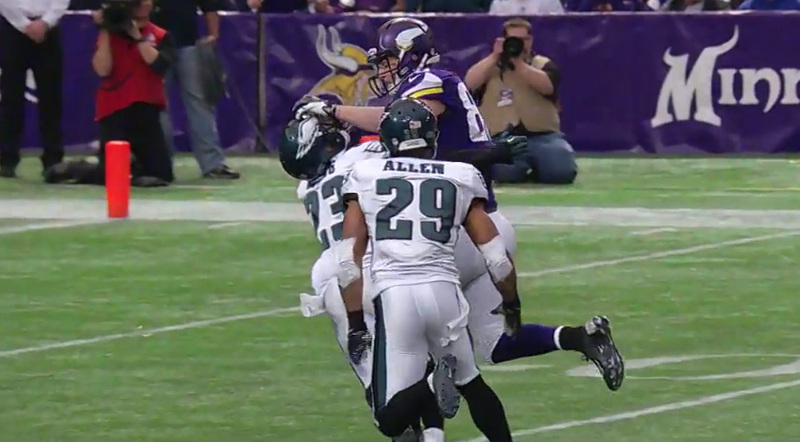 As noted above, the Eagles are pitiful at rushing the passer. Trent Cole and Connor Barwin are T-58th in the league in sacks, so there is no one player they can at least lean on to get the QB. When you can not get sacks, the QB has more chances and more time to find his receivers. And against the Eagles defense, it is not a tall task. 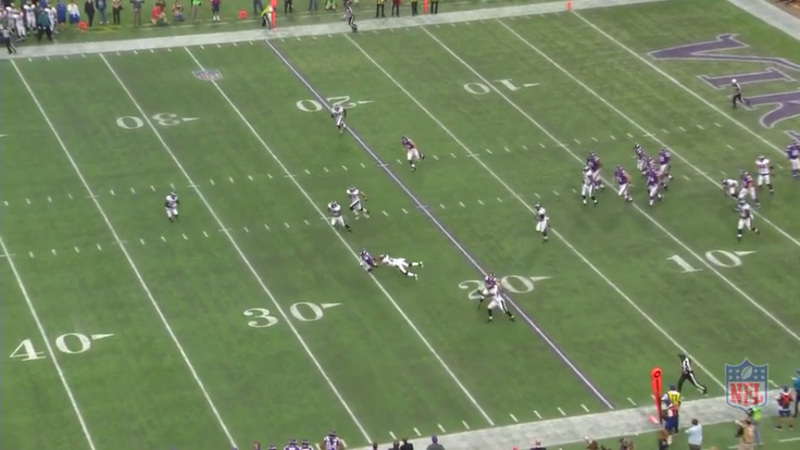 Here, Cordarrelle Patterson will motion across the field deep, behind Matt Asiata, overloading the right side of the defense. As he does, Nate Allen makes a coverage call to Bradley Fletcher and Patrick Chung, in what looks like an audible to a basic Cover 3 Sky, the base call for the Eagles, giving Chung curl/flat responsibility. So we must assume that Chung, despite his flaws, is in the right on this play. Chung hightails it to the numbers but Trent Cole, not hearing the audible, also covers the curl/flat area, leaving TE Chase Ford unmolested in the zone that Cole should have dropped to. Chung then has to reverse course, but by then it is too late. 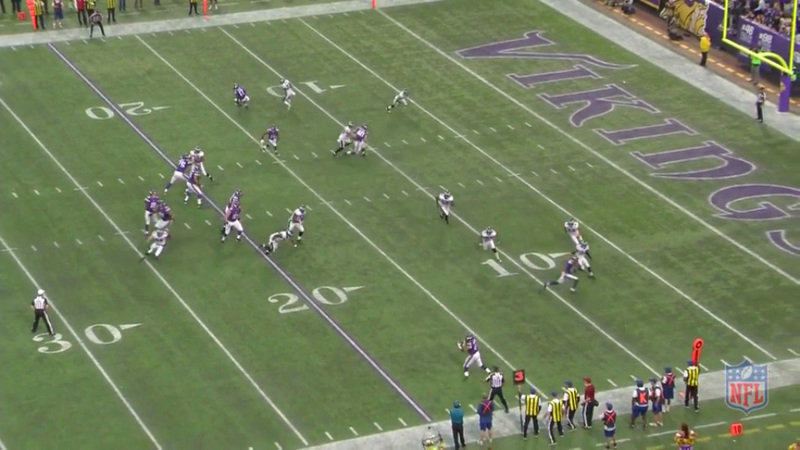 Matt Cassel hits Ford in the vacated zone for an 18 yard gain. 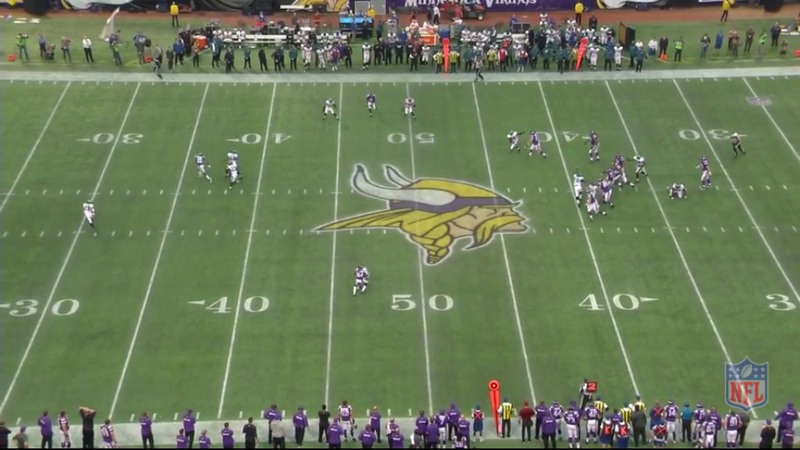 The Vikings took advantage of the Eagles inability to react pre-snap all game long. 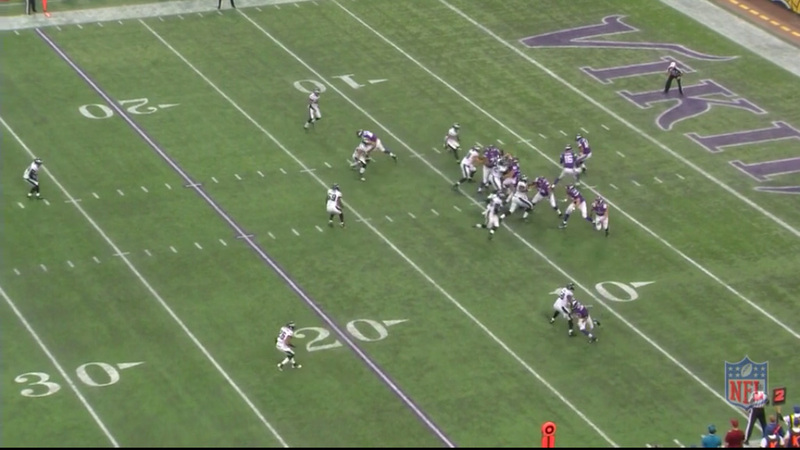 Here they empty the backfield by motioning Matt Asiata wide and create confusion. 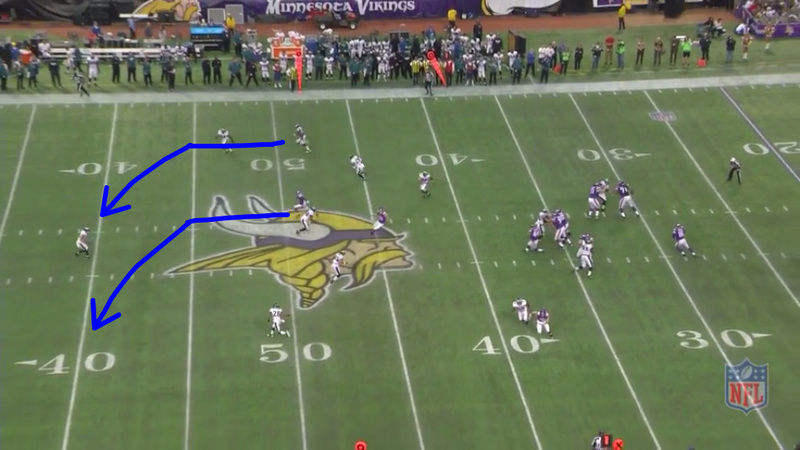 Mychal Kendricks motions Kurt Coleman to cover Asiata even though Kendricks is closer and with an empty backfield Kendricks has no reason to cover the middle of the field along with DeMeco Ryans. 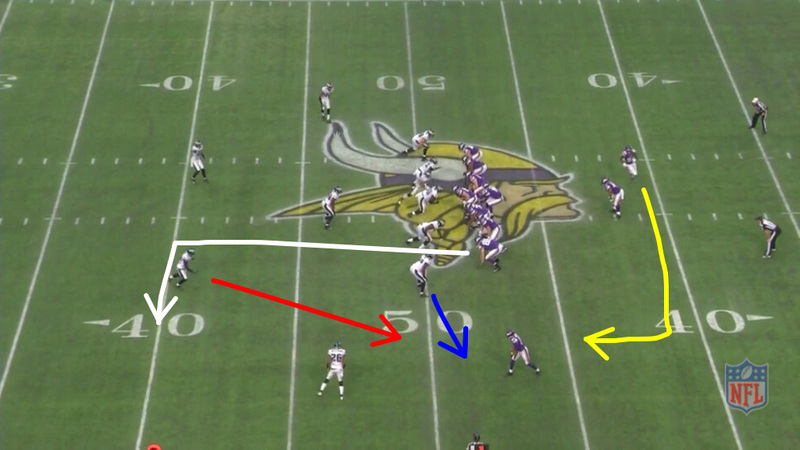 Kendricks–who for some reason moves further inside until the ball is snapped–Coleman and Ryans all rush to flood the area, but it is too late. 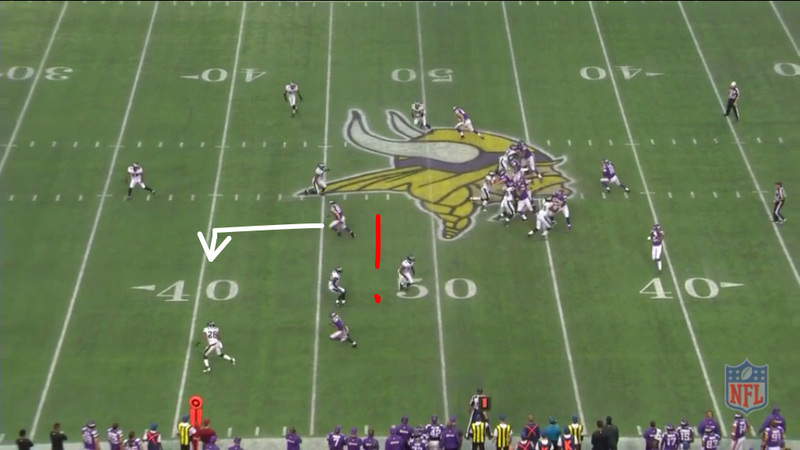 Asiata has the ball and gets by Kendricks, who has taken a bad angle and forces Asiata back inside against flow, and gets the first down. Cary Williams was benched for poor play, and it was deserved, but Bradley Fletcher was not much better. Yes, he gets a hand in on the second one, but because the ball was underthrown. Compounding all of this is the total lack of depth the Eagles have in those areas. The Eagles are unable to get a pass rush going, but the same OLBs play essentially every snap when in base defense. Chung lost his starting job to 5th round rookie Earl Wolff, who has played well, and then against the Vikings Chung was benched for Coleman, who is terrible. Behind Williams and Fletcher is Roc Carmichael, who was signed off the Texans’ practice squad. Behind Ryans and Kendricks is Najee Goode, who was acquired off waivers in training camp. Wolff’s been a nice addition and Carmichael and Goode did nice jobs in relief, and every team has castoffs and late round picks as backups, but every backup? That is paper thin depth. Bill Davis continues to put his players in positions to not make plays. The Vikings are lined up in a Full House formation, with FB Jerome Felton and Ford split at FB depth and Asiata completing the trio. They have not faced this formation much this season, the Packers also run it occasionally. 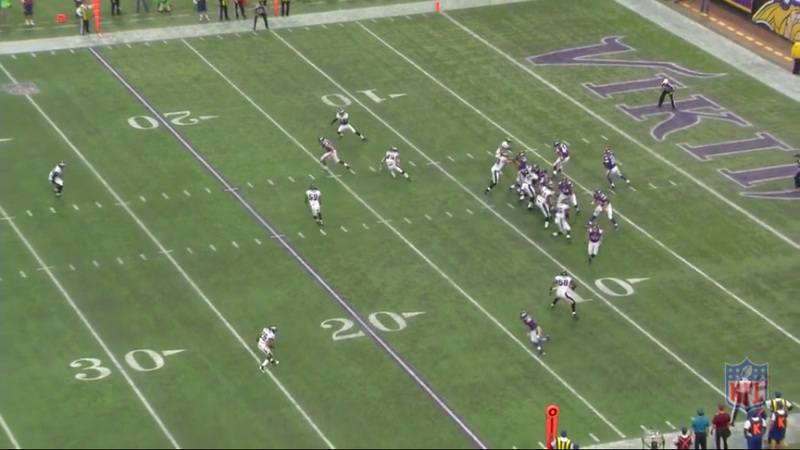 Additionally, TE Rhett Ellison is on the left, Jarius Wright, who had all of 19 catches entering the game, is the only WR on the field. Davis decides to give Wright bracket coverage with Trent Cole lined up against him. As noted in the past, when you do this you are telling the defense what you are running, and with Cole rather than Connor Barwin, you’re giving the offense an even bigger advantage. Wright runs right by Cole’s weak attempt to chuck, and now has a 23 by 14 yard box of open space to catch and run and make a play. Which he does for a 26 yard gain, thanks to a Cary Williams broken tackle. 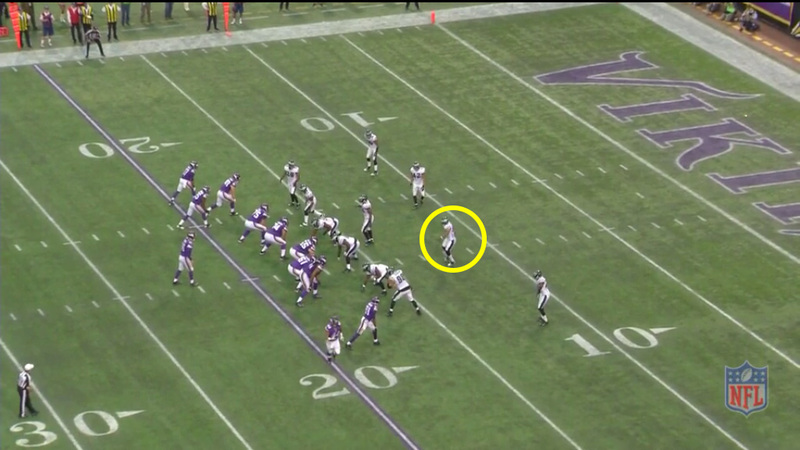 Let us get the Greg Jennings TD over with quickly and with one hand over the eyes. 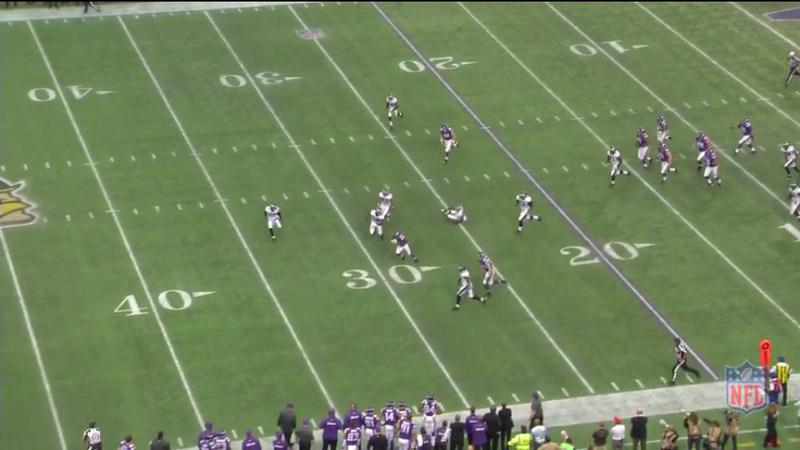 Two problems with this play, which happened before Boykin was hurt. 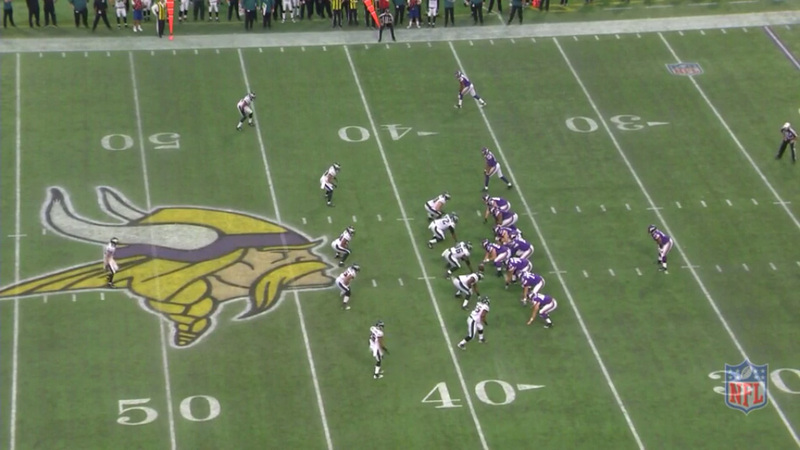 The first is the Vikings have three WRs on the field and the Eagles are not in nickel. Inexcusable. The other is that this is another LB bracket call, so Cassel knows it is going to be Cover 2, meaning there is a seam open in the middle of the field. (It could also be Cover 6, leaving the same seam open, though not as wide.) 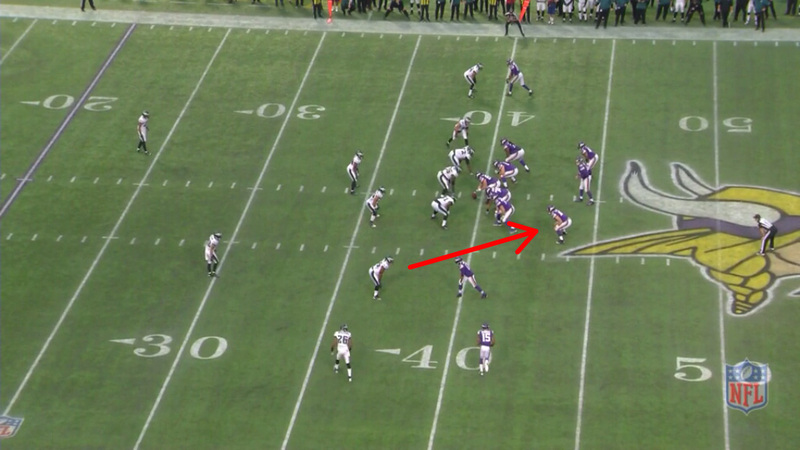 When the Eagles use this coverage, they generally shade the safety opposite the bracket to the other side. 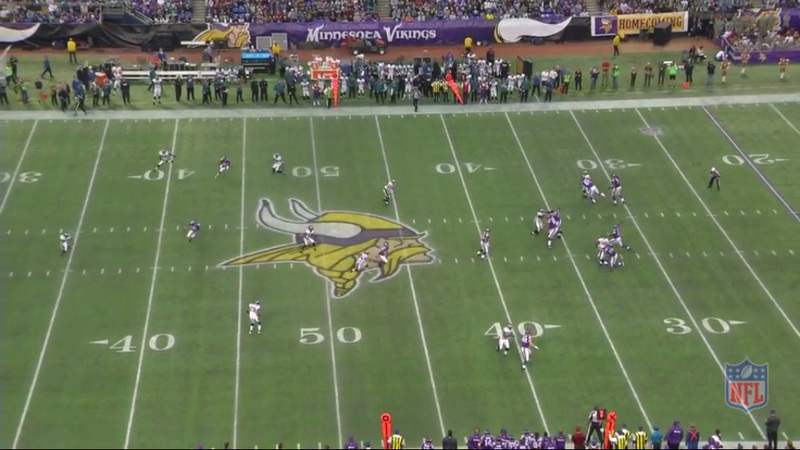 If Jennings can get past Chung, which he of course can, he’ll be wide open. And he is. Fletcher is focused on Simpson and Ryans turns his back on Jennings, who gets past Chung. Allen is too far away to offer any help. As bad as it was, it could have been worse. Davis’ strict adherence to his corners staying on the left and right side means that against two wide receivers on one side, the defense knows it is a zone call. They should instead be pre-snap man matching, with Williams or Fletcher in the slot and Nate Allen in the place of Williams or perhaps even better, high in a two deep shell look to disguise the coverage. 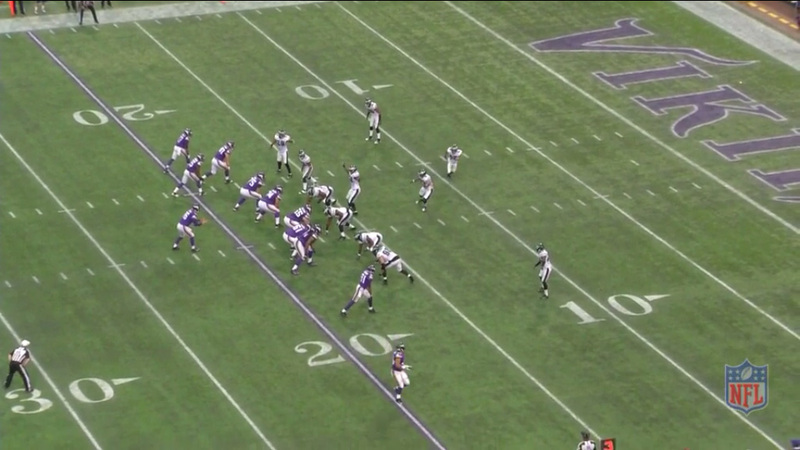 This would give the defense a man look that can easily be zone, giving the offense no pre-snap advantage. 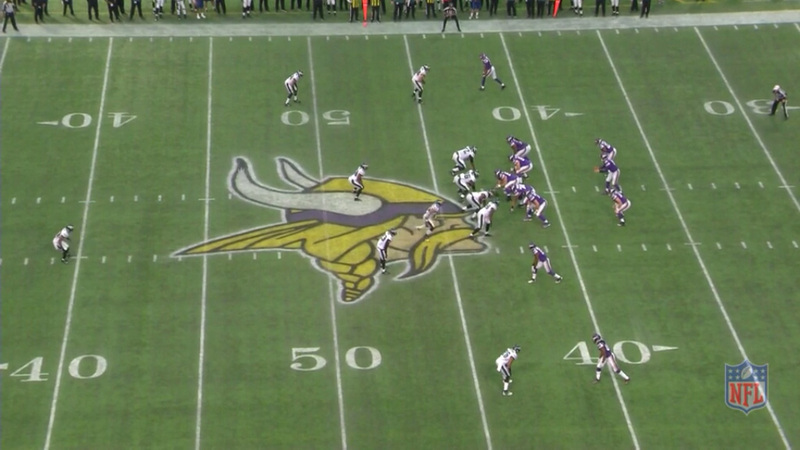 Instead it is another Cover 3, with CBs and FS deep and LBs under. 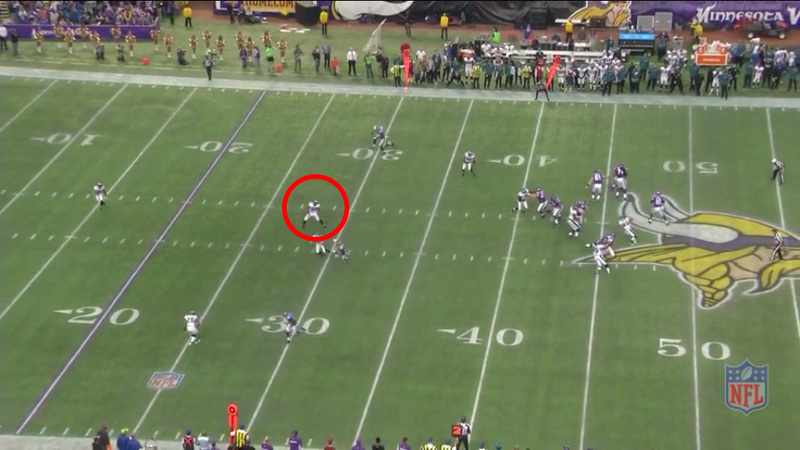 Allen feigns a bump on Simpson and then drops to a redundant deep zone with Fletcher. Jennings breaks inside them for a 22 yard catch. 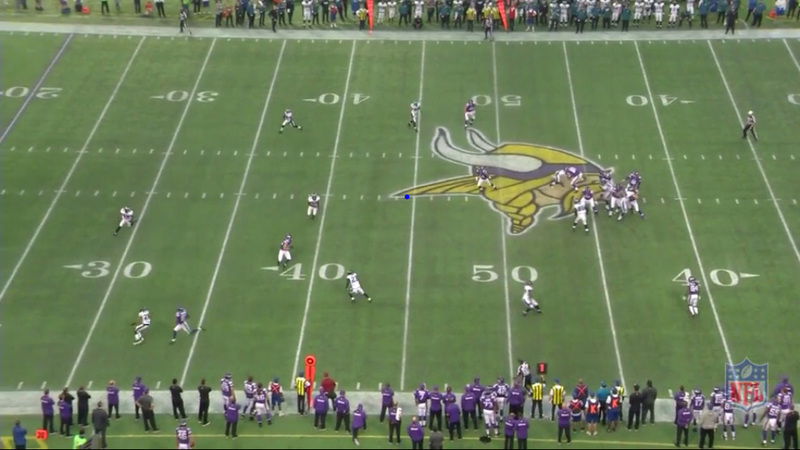 But Cassel missed Jerome Simpson, who drops in behind DeMeco Ryans, who was pulled off his zone by Ford despite Kendricks having that covered. 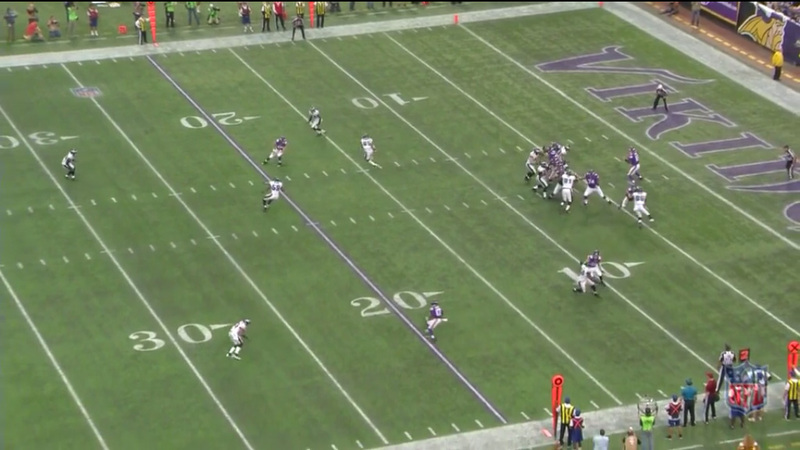 Had Cassel thrown to Simpson, he could have had a bigger gain and possibly a TD. A recurring theme for Davis is to put a LB in the slot and have him rush the passer. 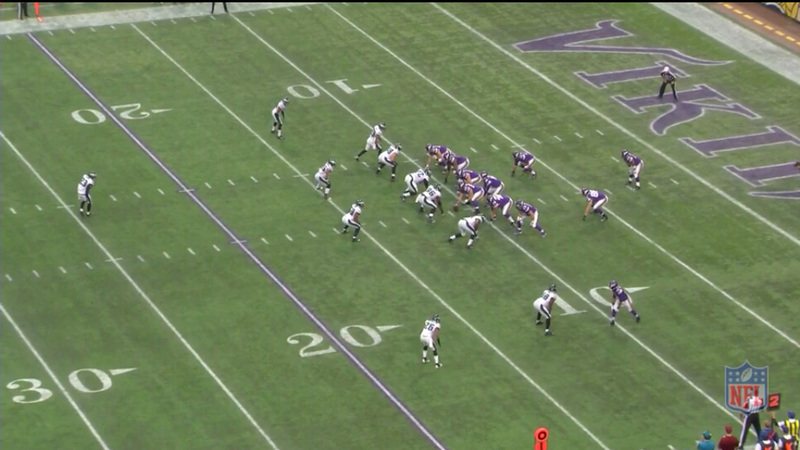 And every time the LB, through no fault of his own, can not get there in time. On this play it is Brandon Graham’s turn to be irrelevant. 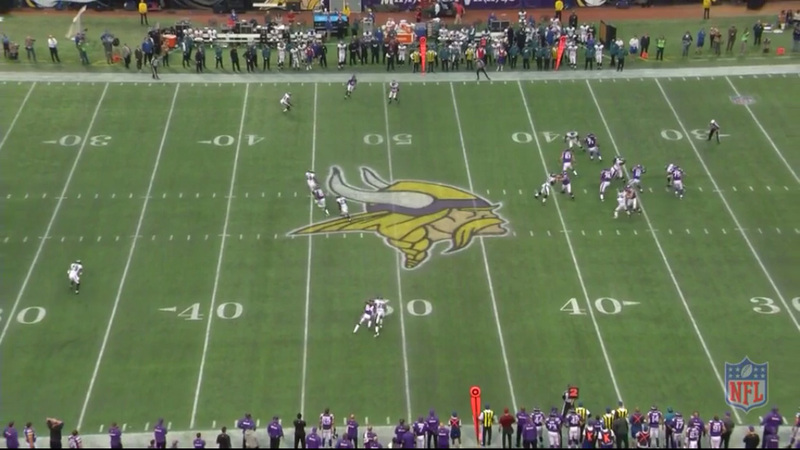 Making matters worse, once again the Vikings are in 3 WR and the Eagles are not in nickel. Graham is unable to get any pressure because he has so far to go. Players can not be productive when they are put into impossible positions. Meanwhile Ryans is dragged from his middle of the field under zone by Jennings, opening enough space for Simpson to make a 19 yard catch. Ryans gets there just after the catch is made, had he not shaded to Jennings or if he was quicker, he may have been able to break up the catch. Nothing went right in the passing game. While the return of Earl Wolff will help, the defense is not going to suddenly turn it around and there is little reason to expect it to. It is still the same players we have seen all year missing assignments and the same plays being called that take players out of position to make plays. It could be a very long day for the Eagles defense against the Bears. Very useful information. Hope to observe more blogposts soon!